For hundreds of years, Haitians have told stories of zombies—soulless bodies brought back from the dead to do the bidding of evil sorcerers. Until 1980, most people considered the tales to be little more than legend. That was the year that a man by the name of Clairvius Narcisse paid a visit to his hometown in Haiti. His friends and family were a little surprised to see him. That's because, according to his doctors, Clairvius Narcisse had been dead for eighteen years. Narcisse believed he had been bewitched by a bokor (sorcerer). He said that at the time of his “death,” he'd found himself completely conscious but unable to move. He even remembered the doctors pulling the sheet up over his face. Afterwards, his body was stolen. Once he was able to move again, he was put to work on a sugar plantation alongside other “zombies.” When the bokor who’d enslaved him died unexpectedly, Narcisse escaped and began the long journey home. Thanks to Narcisse, scientists finally began to investigate Haiti's zombie tales. One doctor, Wade Davis, eventually claimed that he'd discovered a scientific explanation. The bokors believed to be responsible for zombies used a variety of unusual powders in their rituals. Most of the powders Davis tested included a number of bizarre ingredients, including human remains and the dried corpses of two poisonous frogs. But there was one ingredient in the so-called "zombie powders" that intrigued Davis the most. 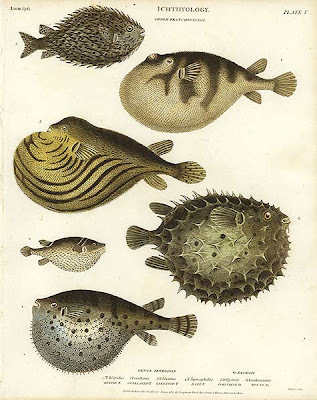 It was the ground remains of the pufferfish, an animal whose organs contain a deadly neurotoxin called tetrodotoxin. When consumed or absorbed through the skin, tetrodotoxin can paralyze the human body, even slowing the pulse to the point where the person appears to be dead. Dr. Davis believed that the bokors poisoned their victims with tetrodotoxin-laced zombie powder. The victims' families, thinking them dead, would have the bodies buried. The bokor would wait for the lack of oxygen inside the coffin to cause brain damage, then dig up their "zombies" and put them to work. Dr. Davis’s theories were—and continue to be—quite controversial. But anyone interested in learning more can click here. wow. That is SO terrible! Talk about a wierd form of slavery. Or zombie-ery. Do you think that the person was poisoned before he "died"? Beef: That's what they say. The poison makes them appear to be dead--when they're actually still alive. That's cool. Weird. Scary. Terrible. All at the same time. OOps. I just posted as John.. Ugh. I read about the fugu a couple years ago in this huge article National Geographic did on poisons, fascinating. You can read more about zombies in the book The Magic Island by Mr. Seabrook. It's a pretty old book so some of the author's attitudes are racist by today's standards, but it's interesting stuff. Woah! i never knew that ill have to look up more about that! :) thx ananka! i enjoyed it. is there a website about it? I'm gonna do that to my sister. *D lol, I wanted to try fugu for so long. didn't you post about that a long time ago??? wow! that might be the most interesting thing ive read on here. Excellent work, everyone!